Climate change is ravaging the ice that covers Antarctica, and how fast it melts will make a huge difference in how fast oceans rise. But the shape of the bedrock underneath is as important as the temperatures above to understanding what comes next for the seventh continent. 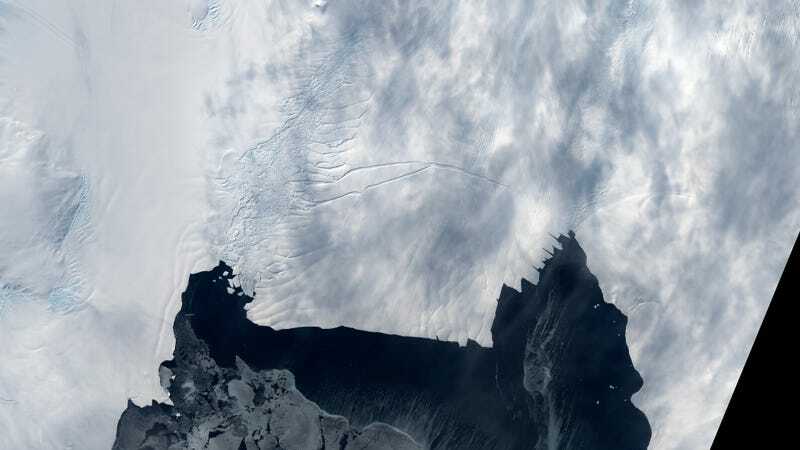 New research published in Nature Communications on Monday provides the highest-resolution glimpse of the landscape beneath Pine Island Glacier, one of the most vulnerable glaciers in West Antarctica. It shows a surprising variety of terrain that, in addition to being fascinating, could dampen the impacts of climate change for a bit. Researchers with the British Antarctic Survey made the map using data gathered over three research seasons in Antarctica by dragging a radar sensor behind a snowmobile over Pine Island Glacier. The radar was able to penetrate the ice—which is up to 1.5 miles thick—and show the features of the bedrock below. “The data...constitute by far the largest and most spatially detailed observational data set of a contemporary subglacial landscape ever acquired,” the researchers wrote. The findings show the flat white surface of the ice gives way to an amazingly varied topography below. That includes ridges in the bedrock up to 1,300 feet in height, and valleys that were equally deep, both of which surprised researchers. Those features play an important role in regulating how fast ice flows to the ocean. Tumbling down from West Antarctica’s massive ice sheet and over the ocean, the Pine Island Glacier is already one of Antarctica’s fastest moving and most vulnerable glaciers. It holds back enough ice to raise sea levels nearly 5 feet. Prior to creating the detailed map, researchers knew that the bedrock sloped downward. Ocean waters warmed by climate change have been cutting away at the ice from beneath. That quirk of geology has allowed them to cut further and further inland, increasing the glacier’s instability. This process isn’t going to stop anytime in the near future as temperatures continue to climb, which is bad news for ice, and for sea levels around the world. But the new study offers a small silver lining—things could actually be worse. If carbon emissions are humanity jamming its foot down on the gas pedal of runaway ice melt, the rough topography under Pine Island is acting like brakes. If Pine Island’s bedrock were smoother, the glacier would move even faster toward the ocean, and sea level rise would accelerating even more rapidly. This good news is tempered by the fact that unfortunately, we’re pushing harder on the gas than the brakes can handle, meaning the Pine Island Glacier will continue to drop an ever-increasing amount of ice into the ocean. Its next door neighbor, the Thwaites Glacier, is even more susceptible to rapid retreat and corresponding sea level rise, which makes understanding the nuances of its base even more important. Bingham said there’s a joint UK-U.S. effort afoot to do a similar experiment at Thwaites, but it’s a time-consuming process done in punishing conditions. They started gathering data for these results in 2007. In the rapidly-changing Antarctic, waiting another 10 years to get similar information about the Thwaites Glacier could be too late, since it’s already on the brink of unstoppable melt.